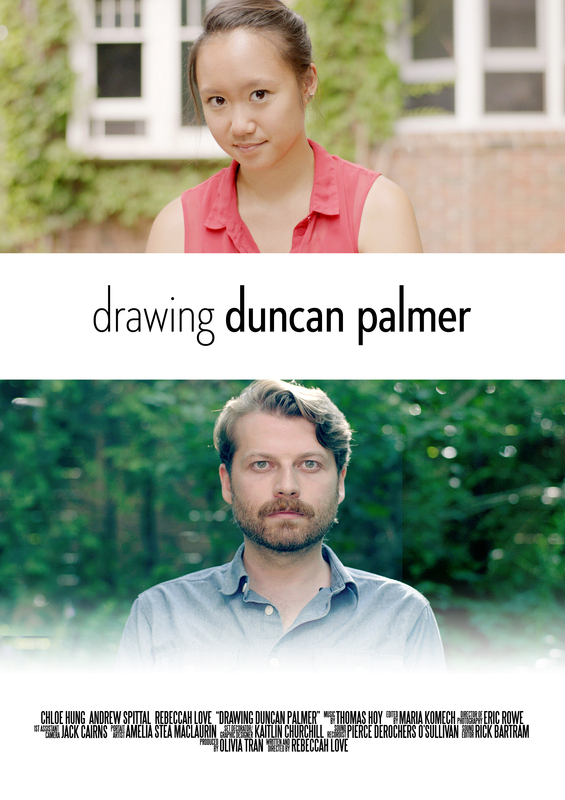 Rebeccah Love’s Drawing Duncan Palmer is finally getting its first public screening at the MDFF screening series and it should be memorable. It’s a touching short film as it peels away the superficial rhetoric of Toronto to focus on more honest emotions: what’s it like to lonely and what it’s like to be sad. In it Miriam (Chloé Hung) and Zoe (Love) had organized a fundraiser for a scholarship in the memory of their recently deceased professor Dr. Crawford and which their fellow student Duncan (Andrew Spittal) had outbid everyone else to win the opportunity to have Miriam draw his portrait. Drawing Duncan Palmer begins with Miriam spending time alone preparing to hang out with Zoe to go over the results of the silent auction. There’s an elegance to this scene as Miriam takes her time baking cookies and preparing some snacks. You see her get all of the ingredients ready, mix them in an ornamented bowl, put the batter in the oven and quietly drink some water while waiting for everything to be ready. Love’s camera captures an appreciation for the smaller moments of life and the reserve of having to do it alone, which is only heightened by Thomas Hoy’s elegiac score. When Zoe does finally arrive (talking about gardening, almost in anticipation to Acres) they have fun and she encourages Miriam to ask Duncan out on a date (why else would he spend so much on a portrait?) on the Saturday when he comes over. She’s eager and nervous and courageous when she finally poses Duncan the question but as it turns out he only bid so much for the portrait so that he could put it up in his apartment beside that of another one of a person whom he truly misses. With an official filmography of just a few short films: Drawing Duncan Palmer along with Abacus, My Love, Pitching for the Heights, Circles (which she wrote and art directed) and the upcoming Acres Love already has an impressive oeuvre. But as it turns out it also includes a series of videos that can be found on her YouTube channel beccahlove. These videos reveal almost an experimental filmmaker stage in Love’s oeuvre as these home movie-style works include stylistic effects that further heighten everyday experiences to the level of poetry. In them the world, Love’s relation to it and its filming become organically intermingled so that an imagination becomes the starting point: people get out of their comfort zones to be freer to enjoy and live life. What especially stands out is how Love is able to joyously capture communities coming together and the casual articulation of a philosophical idea. Behind these modest works with their emphasis on a joyousness and imagination is the expression of an egalitarian politics and democracy: access to community and country is a moral right and everyone has a role to play in the pursuit of the common good. If there are negative repercussions of a gender imbalance in the Canadian film industry: it’s that there aren’t more films like those of Rebeccah Love that have such a kindness to them (though Mes nuits feront écho by Sophie Goyette that’s premiering at FNC or Sofia Bohdanowicz’s Never Eat Alone that’s premiering at VIFF are steps in the right direction). Rebeccah Love’s films are a reminder of how the gift of intimacy can speak volumes.